Who doesn't love a cocktail or two? Be it something sweet and fruity or something with a little more complexity, a creatively concocted cocktail done well is truly something to behold. And then drink, obviously. 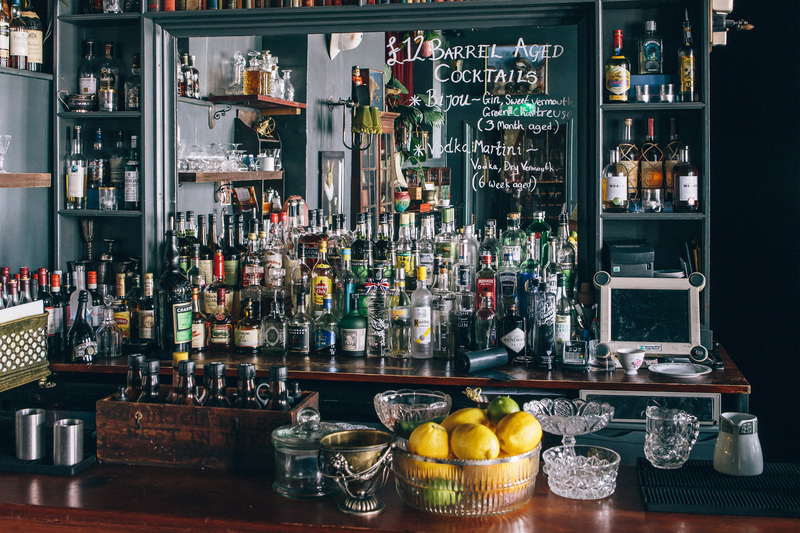 Bristol is lucky enough to be blessed with some stand-out bars, restaurants and pubs in which to partake in such tipples, so take a look below for those cocktail bars we've selected as our favourites and prepare to whet your whistle. An Old Fashioned for us, if you don't mind. 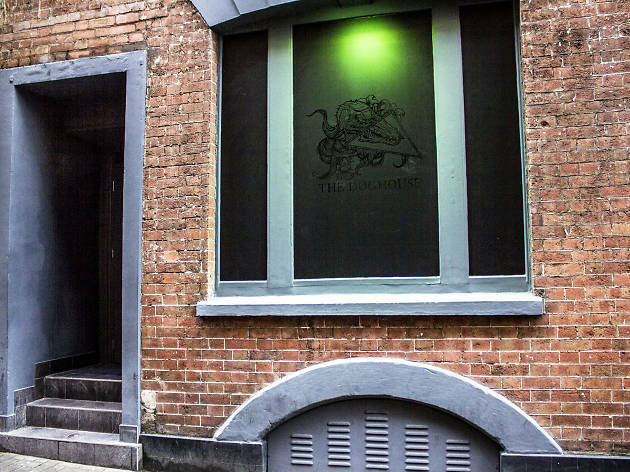 Hidden in plain sight, it is likely that even some of the drinkers in the White Lion pub next door might not know that the Milk Thistle contains four floors of decadent excess. If you don’t like wood panelling and taxidermy, look away now. 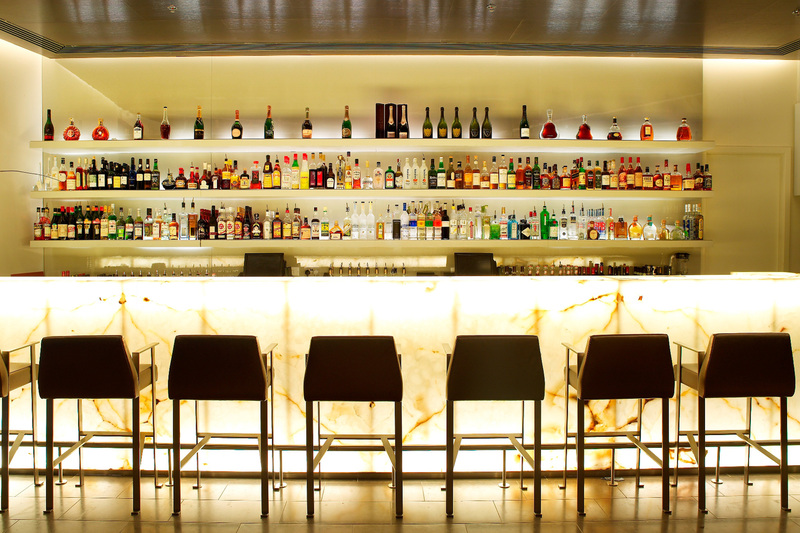 Each level has a different function, with the ground floor cocktail bar serving some seriously superb concoctions. If you’re here with a group of friends, try the Milk Thistle punch - delicious. 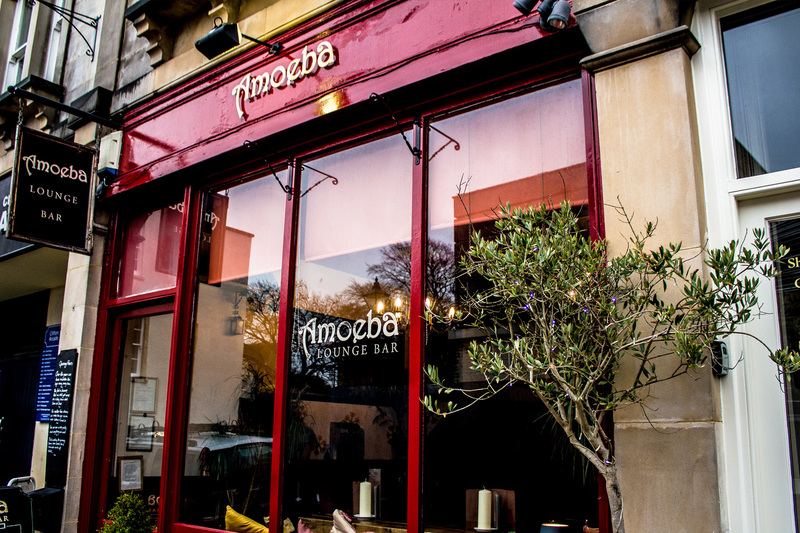 If you find yourself wandering Park Street in search of a good cocktail, then stop wandering. 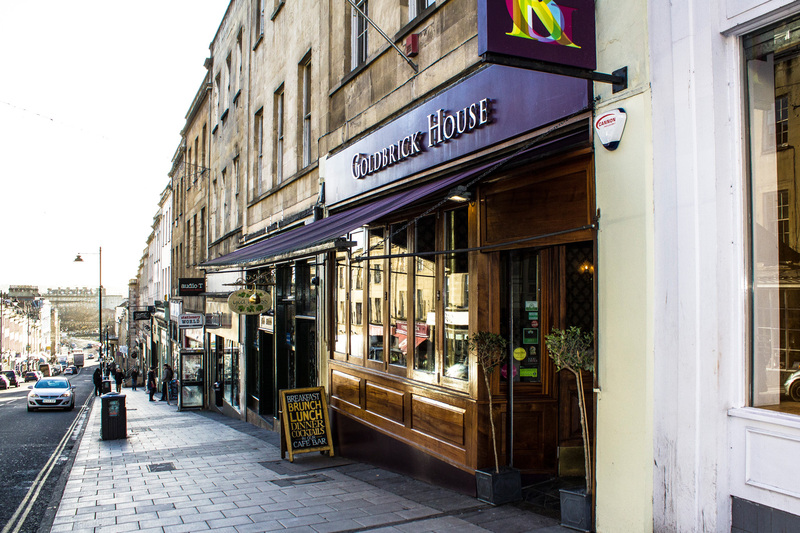 Goldbrick House is just there. In you go. To start with, there are five pages of carefully chosen cocktails, some as kitsch as a 1950s drinks cabinet: think charlie chaplains, grasshoppers and juleps. Others are downright, mouth-wateringly odd. There are gin and rum punches for sharing with a group for £25, or an eye-wateringly expensive Fish House Punch, involving Hennessey Paradis cognac, 21-year-old rum and a whole bottle of Krug Grande Cuvee. For a casual £500. Red Light advertises its presence on Union Street by, well, a red light, emanating from a graffiti covered doorway. Pick up the payphone, press the button and… presto. 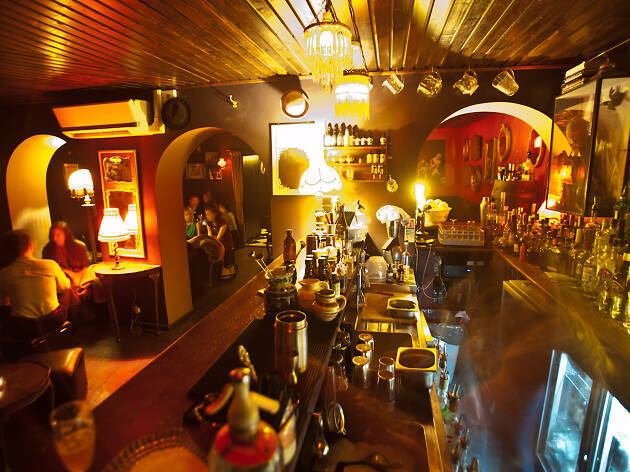 Billing itself as a late-night drinking den, with an air of 1950s panache, Red Light has a cocktail list that pairs customisable classics with new creations. 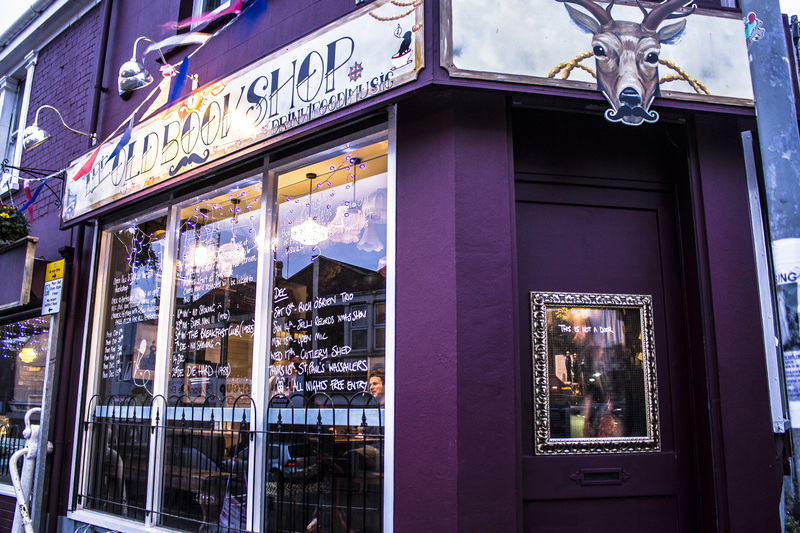 True to its location, it’s about quality, not crowd-pleasing. Priced between £8-£10, there’s a sliding scale of cocktails, from sharp and acidic down to sweet and syrupy. A cocktail bar on the second floor of Harvey Nichols? It's actually cosy, friendly and chic. 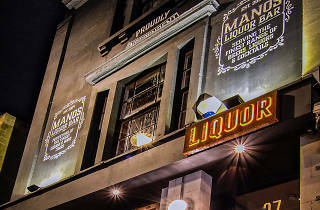 There’s a quality cocktail list featuring all the old favourites, but the real stars are HN’s own, seasonally changing Second Floor Collection. An Ace Martini (cucumber, mint, agave and Hendricks with a twist of black pepper) is sublime, while a Chase Thisi – rhubarb vodka, lemon juice, rhubarb liqueur and pomegranate syrup – is oozingly sweet with a great kick of booze. 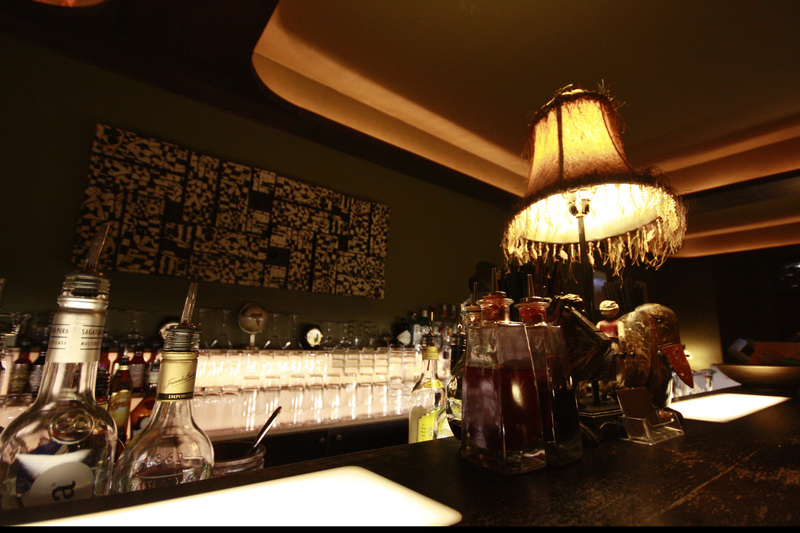 If you like rum, you’re in luck at the Rummer – although the shared monikers is just a happy coincidence. 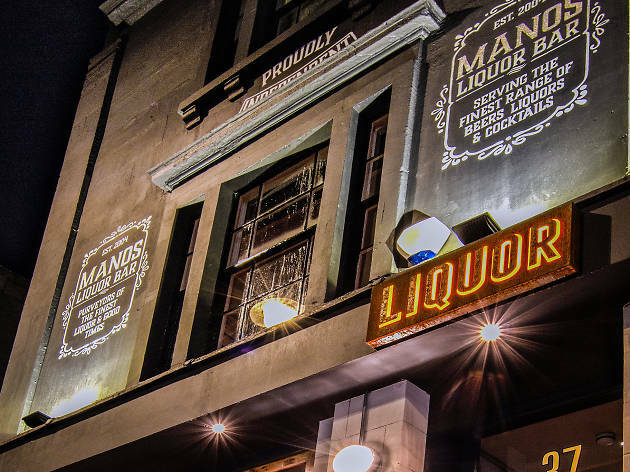 With more than 400 premium spirits from around the globe, it may well be the largest collection in Bristol. Recent addition Cap Savanna Rum comes from Reunion Island in the middle of the Pacific Ocean. 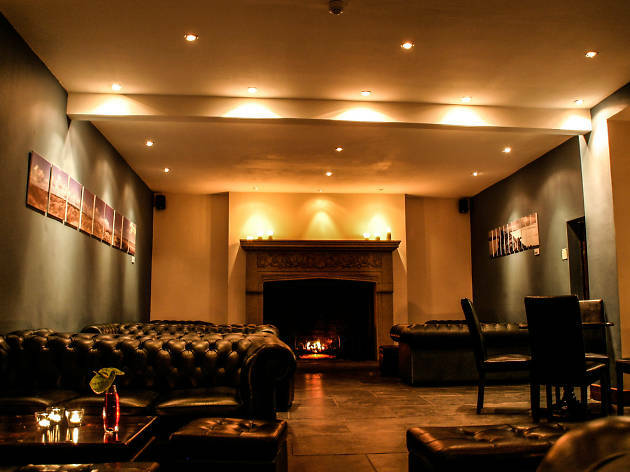 An espresso martini and roaring log fire can also warm the cockles on a cold winter’s night or a day spent exploring the stalls at nearby St Nick’s Market. 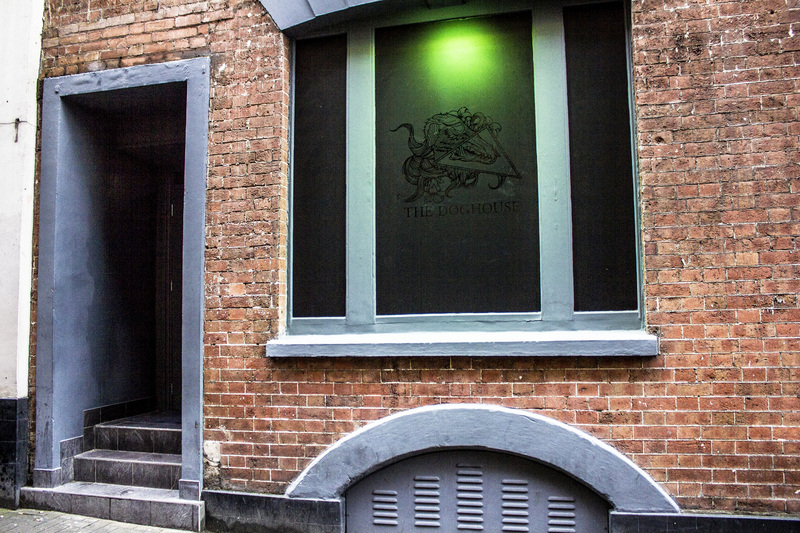 As secrets go, a secret room within a secret bar is as secret as you might get. 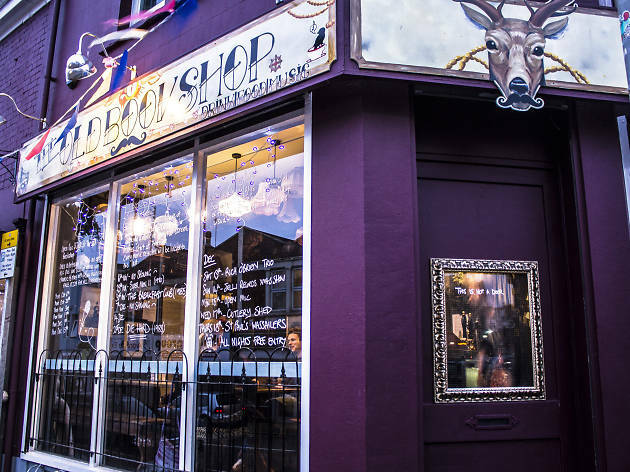 Hyde & Co may be just off the Clifton Triangle, one of Bristol’s busiest nocturnal thoroughfares, near a magic bar and surrounded on almost all sides by kebab shops, but if you didn’t know it existed, you might walk by it blissfully unaware of the delights within. Cocktails dominate but are most certainly not the only drinks here, with bottles of Wild Beer and Burrow Hill cider both making the short journey from Somerset. 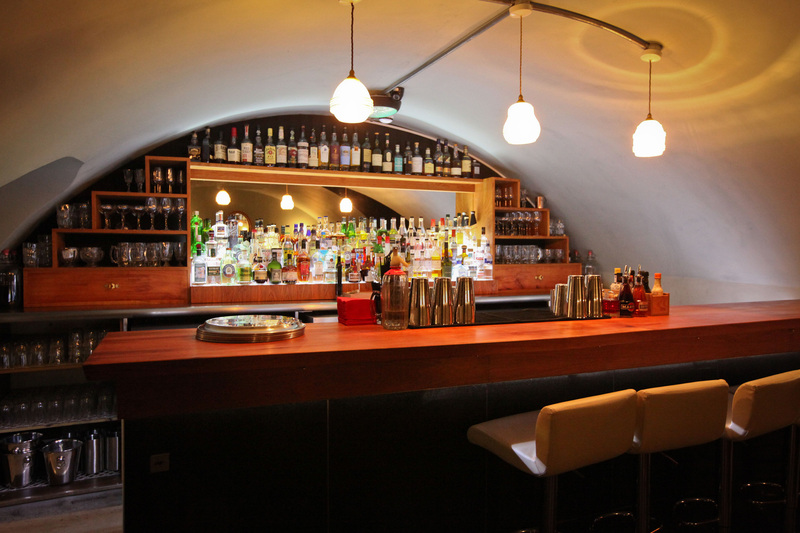 Where else would you find one of Bristol’s coolest bars but hidden underneath an Indian restaurant? 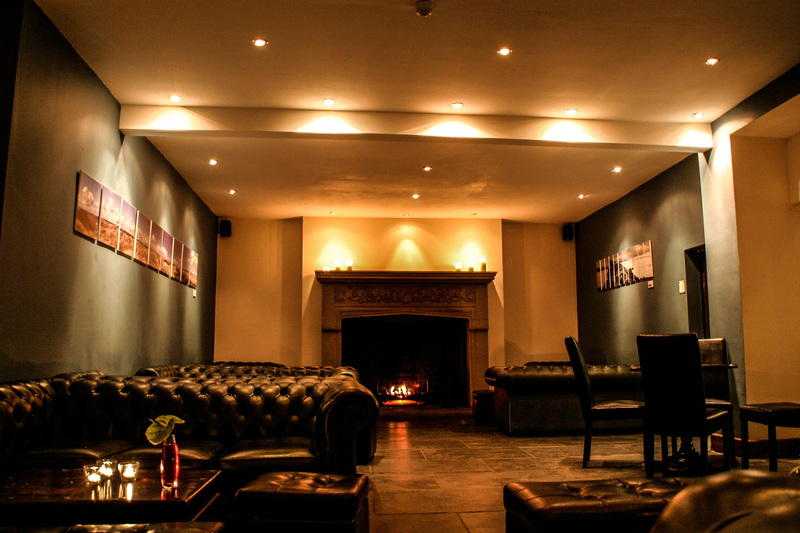 Right at the top of Whiteladies Road opposite the Downs, Hausbar has long been a place to finish a night in style. Owner Aurelius Braunbarth grew up in his father’s Michelin starred restaurant in Germany. 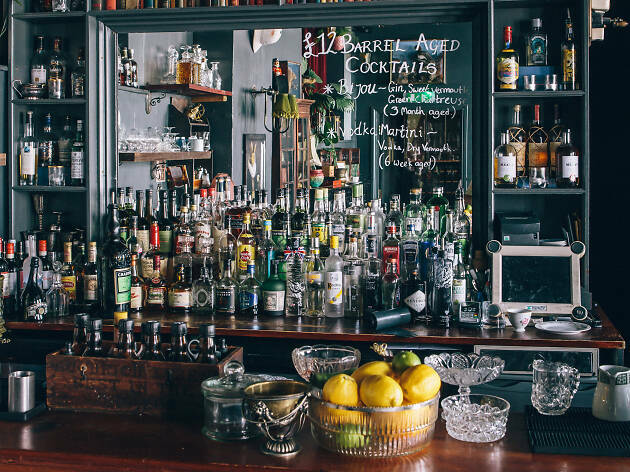 On moving to Bristol, he created a bar that could be straight out of Cabaret – just replace the singing, stockings and suspenders with a splendid collection of spirits. 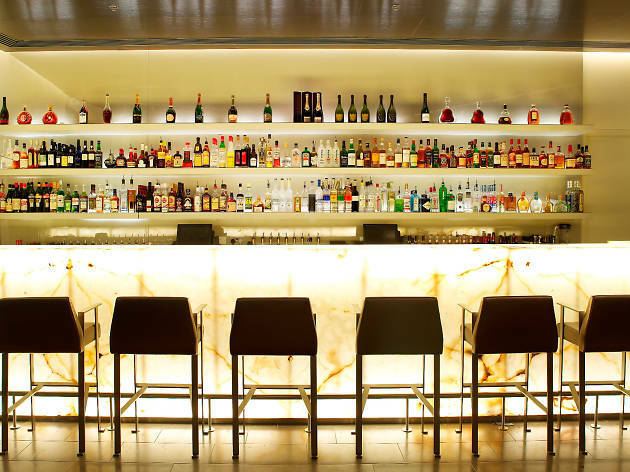 In a dimly lit, long and thin room, the best place to sit is at the bar watching the bartenders at work making Hausbar’s signature mojito or an excellent martini. Cosiness and cocktails are too rarely found together, these days. More often than not, we end up shivering and trying not to slide off a fashionable, yet unaccountably slippery bar stool. Not so at Amoeba. 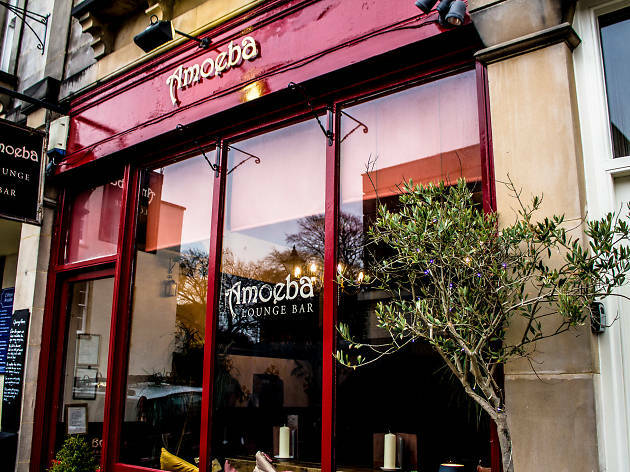 This is a laid-back, lounge bar, where you’ll find good cocktails, a generous, daily happy hour and cushions. And that happy hour? 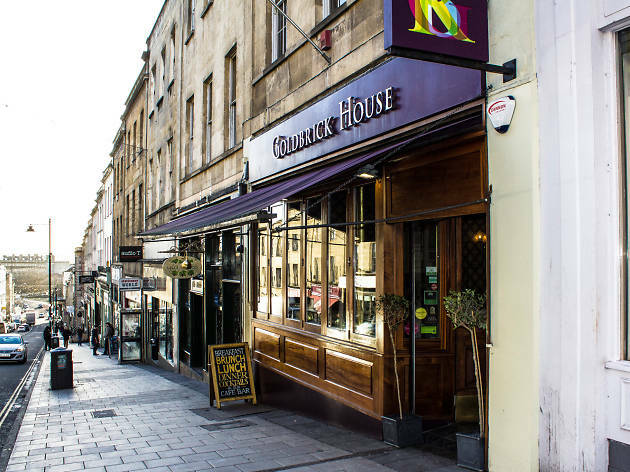 Two cocktails for £9.50 until 9pm every day of the week. Yes, that means Fridays and Saturdays too. There’s a decent list to choose from as well, including mai tais, honeysuckle daiquiris and aviations. Lock your bicycle to the anchor outside; order a drink underneath the trombones, trumpets and tubas fashioned into a light; and then take a seat next to the time machine. 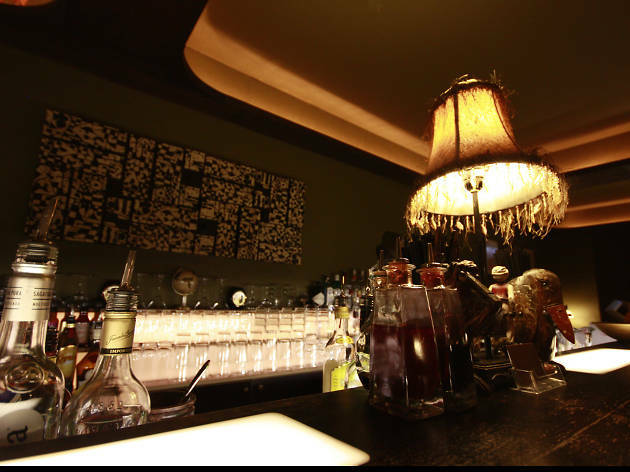 The cocktails (from the bar within a bar - No.63) are a particular strong point, with bespoke creations put together with some very skilled hands behind the bar. Claustrophobes, we’re sorry. 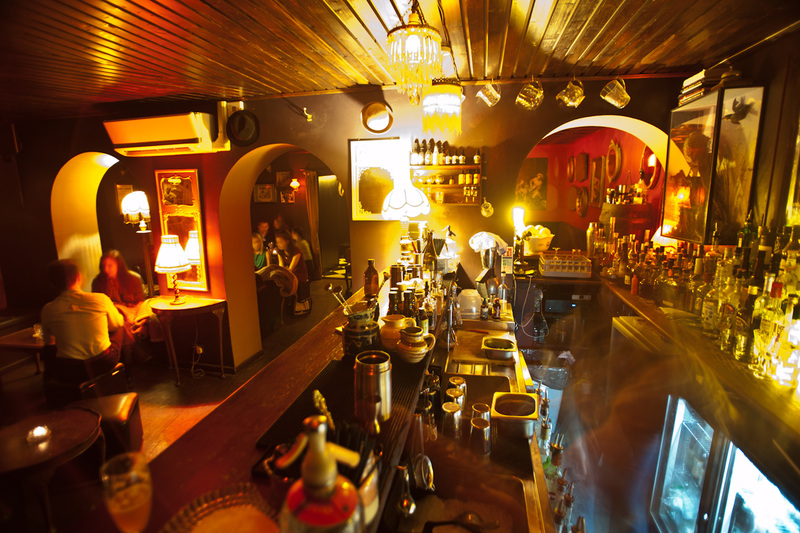 Some of the bars on this list unfortunately just won’t be for you. In Bristol we’re always much more likely to build a bar underground than on the top of a grand skyscraper. 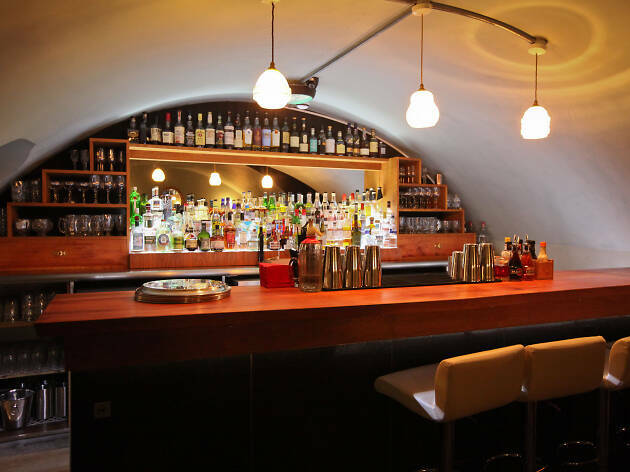 Superb subterranean cocktails complement a cracking music selection. Give the Swamp Monster Times a go - a mix of green Chartreuse, kaffir lime leaves, coriander syrup, rhubarb, lemon juice and egg white.